Akcakale, Turkey—The Kurdish militia that supplies the ground troops in the US air war against the Islamic State has been a systematic violator of human rights in the area it controls in northern Syria, causing the displacement of tens of thousands of Arabs and even more massive flight by Kurds from the region. This is the first of a two-part investigation, which was supported by the Fund for Investigative Journalism. A six-month investigation shows that the militia, reportedly under the strong influence of Iran and the Assad regime, has evicted Arabs from their homes at gunpoint starting in 2013 and subsequently has blown up, torched, or bulldozed their homes and villages. The Nation interviewed more than 80 Arabs and Syrian Kurdish refugees in the region as well as militia officials, former militia members, former Syrian government officials, political activists, and officials in Iraqi Kurdistan. The pace of the expulsions picked up dramatically after the United States began joint operations against the Islamic State in Syria in mid-2015, as the Kurdish militia threatened Arabs with air strikes if they didn’t leave their villages. While they slowed in 2016, expulsions continue even as the militia turns on its political rivals and jails, tortures, or expels them. 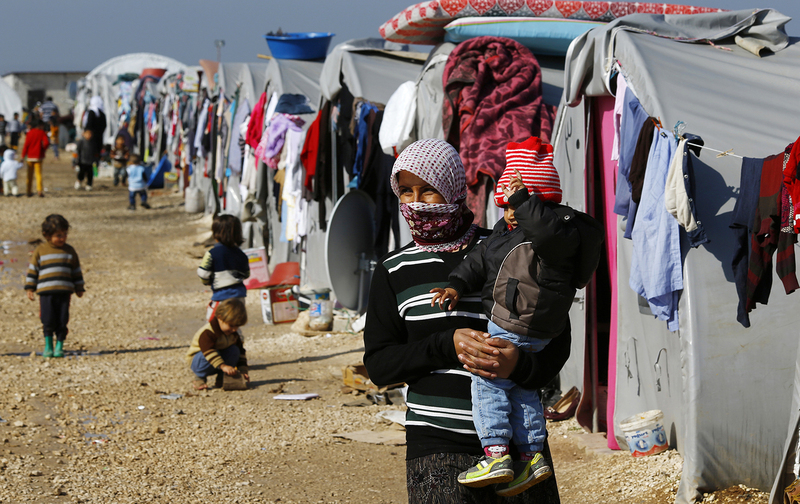 At least 200,000 Syrian Kurds have fled to Turkey rather than submit to forced conscription and political repression. At least 300,000 Syrian Kurds have also fled the region to neighboring Iraqi Kurdistan, according to officials there, and no fewer than 200,000 have fled to Turkey rather than submit to forced conscription and political suppression by a group that insists on ruling as a one-party state, according to Kurdish human-rights monitors in Turkey. Officials in Iraqi Kurdistan say that if the Syrian Kurdish militia opened the borders, at least half the Kurdish population under its control would flee. The militia, which calls itself the People’s Protection Units, or YPG, is the Syrian wing of the Kurdistan Workers’ Party, or PKK, which has fought a long, off-and-on guerrilla insurgency against the Turkish state since 1984 that reignited in mid-2015 and continues today. The Obama administration insisted that the PKK, listed by the United States as a terrorist group, is separate from the YPG, a stance that allowed Washington to circumvent laws prohibiting dealing with such groups. Numerous witnesses, including four PKK defectors interviewed for this article, call the US stance a fiction. Is there a YPG separate from the PKK, The Nation asked Mohar, a PKK defector, interviewed outside Syria. “What’s the difference?” he replied. All four defectors said policy for the Syrian region that Kurds call Rojava, or west Kurdistan, is made in Qandil, Iraq, the PKK headquarters. The story of the YPG is not just a tale about the PKK under a different name. It involves other major players that the US government would prefer not to talk about—chiefly, Iran’s Revolutionary Guards and the Syrian regime of Bashar al-Assad. It is the story of a governing authority that has arrested, tortured, and expelled rival political leaders; suppressed independent media and issued death threats against reporters; recruits conscripts at gunpoint; has carried out systematic and widespread expulsions; and has attempted to “Kurdify” traditionally Arab towns. It is also the story of a place so at loggerheads with two of its neighbors, Turkey and Iraqi Kurdistan, that both have closed access to Rojava, including to nearly all foreign reporters. (Some of these abuses will be discussed in part two of this series). Those in charge in Rojava, when asked to respond to allegations against them, have prepared responses that don’t stand up to scrutiny. Dibo said there was one exception to his blanket denial that the YPG destroyed the houses of Arabs. Sometimes villages are caught in the crossfire when the YPG captures towns from ISIS. “How can you liberate an area from ISIS without damaging the houses in that area?” he said. Yet in case after case examined by The Nation, the destruction and expulsions from villages took place after the YPG captured them from ISIS without a fight. Despite extensive documentation of the expulsions by the Syrian Network for Human Rights, a respected opposition watchdog group, the PYD has not carried out an internal investigation. Asked about the SNHR list of 26 completely destroyed villages, 40 partially destroyed villages, and 48 more emptied of all inhabitants in Hasakah alone, Dibo said it’s not the mandate of the PYD to investigate such violations. “Again I confirm that such things never happened,” he said. The US government has also played down the infractions. Even after Amnesty International and SNHR issued major reports in late autumn of 2015, the State Department devoted but one line to the expulsions in its annual human-rights report early last year. Both the State Department and the Defense Department declined to answer specific questions or make any officials available to discuss the Nation investigation, which was underwritten by the Fund for Investigative Journalism. The State Department did not respond when asked to explain how the YPG and PKK are different bodies. One reason for Washington’s near-silence may be embarrassment over the company the YPG keeps. “The dominant force that is managing them is Iranian intelligence,” said Ibrahim Hussein, a Kurd who was a local judge under the Assad regime and stayed on in that position in Hasakah until July 2014. A Syrian Arab who had held a high-level intelligence post in northern Syria agreed. “Iran is the primary funding source for the PKK,” said Mahmud al-Naser, who defected from the Damascus regime in mid-2012. Kurds and Arabs alike say the expulsions are best understood by looking at the PYD’s relationship with the Assad regime. They say the expulsions were not ethnically but politically motivated, directed against the anti-Assad political opposition. Indeed, former residents said YPG Asayish, or military police, after capturing villages from ISIS, arrived with lists of regime opponents whom they then arrested. The YPG’s collaboration with the Assad regime extends to recently active battlefronts. An example is Aleppo, where YPG forces in the suburban neighborhood of Sheikh Maksud attacked the last supply route into the rebel-held eastern sector last July, helping the Assad regime close the road and complete the siege, leading to its collapse in December. The YPG and ISIS have fought each other, but they have also often worked in tandem against moderate rebel groups. Interviews with dozens of Arabs and Kurds who fled Rojava cast doubt on the YPG’s narrative, which the Obama administration regularly promoted, as a heroic opponent of the Islamic State, indeed the only force in Syria capable of fighting ISIS. The YPG calls itself a sworn enemy of ISIS, and indeed the two have fought ferocious battles against each other. But the two groups have often worked in tandem against moderate rebel groups. In several notable instances, for example in Tel Hamis and Husseiniya in Hasakah province, the YPG fought in 2013 to oust moderate rebels of the Free Syrian Army but failed. Islamic State fighters moved in with their suicide bomb units, captured the towns, and in 2015 handed them over to the YPG without a fight. In late 2014, when ISIS attacked Kobani, drawing US air strikes that killed as many as 2,000 ISIS fighters, it was the other way around. According to former residents, the YPG abandoned the outskirts of Kobani to ISIS without a fight, ordering residents to leave the villages they were eager to defend. The expulsions of Arabs attracted little notice in the international media during the period it happened, 2013-15, possibly because it took place far from the main theaters of war in Syria. But the operations left a deep impression on those who carried them out as well as on the victims. Participants attest that the YPG acted jointly with Assad-regime forces. Mohar, 26, was born in Turkey, where he joined the PKK. He trained in the mountains of Iraqi Kurdistan, and then in April 2013 was assigned to northern Syria. Arriving on foot along with some 50 other volunteers, he headed to Derek, a town of 60,000 close to the Iraqi border. In August and September of 2014, Mohar said he directed the attack on Akrasha and Safana, two villages in the far northeast of Syria that the Islamic State had occupied. After ousting ISIS, the YPG went on to torch and bulldoze 13 villages in the area. The first step was to order residents to evacuate their homes. “I received instructions to destroy the villages. I ordered my guys to destroy the houses, to destroy the villages. They poured gasoline on the houses and burned them,” said Mohar, who is using an assumed name out of fear of retribution by the PKK. The experience left a searing memory—not of Arabs fleeing the villages but of animals that could not. “I saw a cow in a house. Unfortunately it burned to death. It’s still on my conscience,” he said in an interview at a location outside Syria. This was not a solo YPG operation, for the Syrian army provided the artillery to shell the village. “They provided tanks and soldiers. They fired. We told them where to shell,” he said. The Syrian regime routinely supplied heavy weapons to the YPG, Mohar said: “I remember once going to Hasakah and getting two tanks.” Other commanders would go to military bases in Qamishli, the main city in Hasakah province, as well as to the city of Hasakah to obtain weapons and ammunition from Assad’s forces. The PYD came to power in Syria not through elections but by invitation, as part of the Assad regime’s response to the national uprising that began in March 2011, when massive numbers of Syrians took to the streets in cities and towns all over the country. With its forces badly stretched, the regime decided to move most ground units from northeastern Syria to Dar’aa in the southwest, where the rebellion first began, and to central Syria. The PYD/YPG came to power by invitation, as part of the Assad regime’s response to the national uprising of 2011. At a meeting in March 2011 with PKK leaders in Damascus, national security aides assigned the PKK the role of suppressing anti-Assad protests in Hasakah province, according to Mahmud al-Naser, who at the time was a top regime intelligence official in Hasakah province. “The message to the PKK was this: ‘We established you. We supported you from 1983. Now it’s your turn to do something for us.’” (He was referring to the founding of the Syrian branch of the PKK in Damascus under the patronage of Syrian intelligence. Naser said the regime of Hafez al-Assad, Bashar’s father, often encouraged the Syrian branch to carry out guerrilla operations as a proxy force against Turkey). In exchange, the Kurdish militia, formally calling itself the Kurdish self-management forces, was authorized to set up its own civil administration in the areas it governed, to take half the revenues from oil produced in the region, and to obtain arms from government security forces, Naser said. Qasim Suleymani, the commander of Tehran’s Islamic Revolutionary Guard Corps (IRGC), played an instrumental role in setting up the arrangements, Naser said. A key meeting took place in the fall of 2011 in Suleymaniya, a city in Iraqi Kurdistan, where Suleymani also arranged for the official return from Iraq of Saleh Muslim, co-chairman of the PYD, where friends say he had been in hiding following a court verdict against him in Syria. Suleymani went on to lead Iran’s expeditionary force that is now fighting with the Assad government against Syrian rebels. The takeover swiftly followed. The Assad regime turned over more than half a dozen major towns to the PYD, including Qamishli, Malakia, Amudah, and Ra’as Al Ein, and allowed it to set up checkpoints and carry weapons at the entrances of the cities. But the Damascus regime maintained checkpoints as well inside Qamishli and Hasakah. In February 2012, the regime issued orders to its forces in Hasakah authorizing the PYD to patrol the border area without restriction. Qasim Suleymani, commander of Iran’s Islamic Revolutionary Guard Corps, played a key role in bolstering the PYD/YPG. Before the anti-Assad rebellion, the PYD had a following in the largely Kurdish northeast, but it was only one of a number of parties in the region, and many Kurds there oriented themselves to the two main Kurdish parties in Iraqi Kurdistan. But all the established parties were caught off-balance by the national uprising and the local demonstrations against the Assad regime, which were led by youths organized into coordination committees. The Kurdish party closest to the protests was the Future Party, led by Mish’al al-Tammu, a charismatic agricultural engineer. Tammu and other Kurds opposed to the Assad regime quickly became the first target in the YPG crackdown. There were mass arrests and assassinations of leaders—first Tammu, killed in October 2011; then Mahmud Wali in September 2012 and Ahmad Bunjak in September 2013. “Certainly the PYD was operating under orders from the regime,” said Ibrahim Hussein, the Kurdish judge. Many regime opponents, all said to be on lists of those wanted by the government, were “disappeared” and never seen again, according to Hussein, and others were arrested or expelled. At the end of 2013, the commander of the Asayish military police, Jwan Ibrahim, said at a news conference that his forces had arrested 5,100 “outlaws and drug traffickers” in the area it controlled. The most dramatic assault on government opponents occurred in late June 2013, when YPG security forces opened fire during a demonstration in Amouda, killing three (and three more in the area soon after). The protesters were demanding that the PYD release anti-regime activists it had detained, but one day later, the PYD arrested another 100 and closed all opposition party offices in the city. This and other such assaults, together with arrests of Kurdish party leaders opposed to the PYD, led to the flight of tens of thousands—to Iraqi Kurdistan, where there are now some 300,000 Rojava Kurds; and to Turkey, where there are at least 200,000. The YPG’s assaults on Arabs began in late 2013, with three massacres, according to the Syrian Network for Human Rights: Al-Aghybish town in November 2013, in which six were killed; Tal Brak in late February 2014, with a death toll of 43 civilians; and Al Hajiya and Tal Khalil in mid-September 2014, in which 42 were killed. Expulsions and destruction of villages also started in Hasakah late in 2013, and gained momentum after the US Air Force began to carry out air strikes to save Kobani from the ISIS assault in October 2014. It accelerated the following year, as the YPG, backed up by US air power, captured the border town of Tal Abyad, which ISIS deserted without a fight. The YPG’s assaults on Arabs began in late 2013, with three massacres, according to the Syrian Network for Human Rights. The expulsions and destruction of villages that began in early 2014 followed a surprising pattern of seeming collaboration between the YPG, ISIS, and the Assad regime with the purpose of expelling moderate rebel forces from key border crossings and major cities across the region. Again and again, in towns where the YPG lacked the manpower or weapons to dislodge the rebels, ISIS forces arrived unexpectedly with their corps of suicide bombers, seized the territory, and later handed it over to the YPG without a fight. Afterward the YPG expelled the Arab residents. Take the town of Tel Hamis, south of Rojava’s biggest city, Qamishli. Rebels from Brigade 313, with support from the Islamist Ahrar al-Sham, captured it from government forces in February 2013, and the YPG was unable to wrest it from them. At the end of 2013, in the midst of fighting, a column of more than 100 vehicles carrying armed Islamic State fighters arrived unexpectedly from eastern Syria and defeated two rebel brigades, Brigade 114 and the Falcon brigade, according to Naser and other sources. ISIS later withdrew to an area 20 miles south of Tel Hamis and turned the area over to the YPG without a fight in February 2015, he said. It was only then that the YPG began demolishing Arab houses, according to the Syrian Network for Human Rights. It began with the burning and bulldozing of a dozen houses in the town itself, followed by the capture of 29 towns in the region from ISIS, which it stormed, destroying nine completely, SNHR said. “People had thought that ISIS had come to help the FSA, but instead they moved around the whole province, kicking the FSA out of all its positions,” said Samir al-Ahmad, a Turkey-based Arab journalist from Hasakah, who has closely watched the events. By March 2014, the Free Syrian Army had lost all its footholds in Hasakah. Another sign of ISIS collusion with the Assad regime: In the three months after ISIS captured Tel Hamis in early 2014, ISIS operatives stole some 90,000 tons of wheat stored in the town and sold it to the Assad regime, delivering it in Latakia, more than 300 miles away on the Mediterranean coast, in lengthy caravans of trucks, said Mahmoud al-Mahdi, head of the Hasakah documentation center in Sanliurfa, Turkey. Syrian journalist Mudar al-Assad (no relation to the Syrian president), who has chronicled the fighting in Hasakah, says there are hundreds of examples of ISIS capturing a village from Free Syrian Army rebels and then turning it over to the YPG without a fight. Not all were in Hasakah. Take Shiwukh, an Arab town of 45,000 in northern Aleppo province on the east bank of the Euphrates River, some 130 miles west of Tel Hamis. Arab rebel forces of the Ahrar Shiwukh and Martyr Abdulaziz Kazzal battalions captured Shiwukh from the regime in July 2012, but they agreed, in a fateful move, to share control with the YPG. In March 2014, without warning, YPG fighters abandoned their posts to ISIS, which then overwhelmed the defenses of the Arab rebels. A year later, in March 2015, Arab rebels and the YPG plotted the joint recapture of the town. But then, according to Isam al-Nayif, a commander of the Ahrar Shiwukh battalion, “the PKK stormed the town without telling us.” (He was referring to the YPG, the PKK’s Syrian affiliate). And that’s when the destruction began. Residents had fled in fear of a battle on their lands, but after ISIS abandoned the town without a fight, the YPG proceeded to destroy farms and burn houses, as well as 3,000 acres of olive groves, Nayif said. They also destroyed two nearby villages. To this day, the residents of Shiwukh have been unable to return to their land. If the YPG’s practices don’t fit the widespread depiction of the militia as the heroic opposition to ISIS in Syria, it may be due to image hype. The legend of the YPG as the only effective ground force against ISIS began when ISIS besieged the Syrian Kurdish border town of Kobani in autumn 2014. After months of fighting, valiant YPG fighters, aided by US air strikes, saved the town, or so the legend goes. But Kurds who fled the Kobani region by the tens of thousands tell a very different story—that the YPG handed the hinterlands of the city to ISIS without a fight, and the Syrian regime, the YPG’s silent partner, watched as armed ISIS convoys moved through the countryside to Kobani. According to Ibrahim Hussein, the Kurdish judge in the northern Syria region under the Assad regime and the PYD until mid-2014, the hostility between YPG and ISIS was feigned. He said that well before ISIS reached villages in the hinterland, “the YPG would come and say Daesh is attacking.” When locals insisted on defending their villages, the YPG “forced them to leave at gunpoint,” he said. This was the inauspicious debut for US joint operations with the YPG; while the Obama administration celebrated its intervention in Kobani as a triumph, the YPG seized the opportunity to pursue a more sinister agenda. As the collaboration with the United States increased in 2015, the YPG stepped up its expulsion of Arabs from the northern border area. This peaked in mid-2015 with the displacement or denial of return of at least 60,000 Arabs after the YPG captured Tal Abyad on the Turkish border, according to Sa’ad Shwish, exiled head of the local governing council in Raqqa. Shwish, who now lives in southern Turkey, other close observers who fled Rojava, and both Amnesty International and the Syrian Network for Human Rights cited dozens of examples in which the YPG drove Arabs from their homes by threatening US air strikes. One such case was Bir Mahli, northeast of Aleppo, where the YPG demanded that villagers abandon their homes and threatened to give the coordinates to the US-led coalition if they didn’t. On April 30, 2015, the YPG called in the air strikes, and 64 villagers, all civilians, were killed, according to Airwars, a British-based group that monitors coalition bombings of civilians. Another example was Arbid, a Bedouin farm village where some 500 residents refused to depart after the YPG’s June 2015 takeover of Tal Abyad to the north. “The YPG threatened to give the coordinates of the village to the American Air Force,” Shwish said. When Apache helicopters began flying over the village at low altitudes, the residents decided to leave for other villages. They’ve never returned, he said. The YPG did not respond to a request for comment. On the heels of the expulsions, the YPG routinely seizes property. Under a regulation known as the “Sponsor’s Law,” the authorities won’t allow people to return unless they have a Kurdish sponsor who can vouch for the returnee, Shwish said. But such references are not easy to find in a region like north Raqqa, where Kurds are only 10 percent of the population. Under international humanitarian law, expulsion of a civilian population when there’s no immediate threat of conflict is a war crime, and if it’s widespread and systematic, it can be a crime against humanity. For this reason alone, the YPG’s expulsions in 2014 and 2015 raise questions about US responsibility. Was the US government aware of the expulsions in real time, and did it seek to stop them? Was it wise to hitch the US Air Force to the Syrian wing of the PKK—a group with its own political agenda in Syria and in Turkey—for the military aim of attacking ISIS but without an agreed political outcome? Expulsion of a civilian population when there’s no immediate threat of conflict is a war crime. Both the Pentagon and the State Department refused to discuss these or any questions about US policy in Rojava, and the Obama administration’s special envoy, Brett McGurk, turned down several requests for an interview. The State Department asked for written questions, but refused to answer them. Expulsions slowed in 2016, but in at least one instance they turned crueler. Standard practice was already a flagrant violation of the laws of armed conflict, for there has been no due process when the YPG has ordered residents to abandon their homes, their livelihoods, and most of their worldly possessions. Masked gunmen usually arrive in the middle of the night, give residents the bum’s rush, and are followed by organized looters, who then strip the property bare and haul off its content. But even these gross abuses hit a new low in the village of Hammam al-Turkman, population 15,000, early last year. Located south of Tal Abyad and north of Raqqa, the capital of ISIS’s self-styled caliphate, Hammam al-Turkman functions as a stepping-stone whenever ISIS decides to launch a raid on Tal Abyad, as it did last February. Entering Hammam al-Turkman, ISIS killed at least three residents and used others as human shields; then in Tal Abyad, its forces killed several YPG fighters. Bolstered by a US air intervention, YPG ground forces chased ISIS out of Tal Abyad and Hammam al-Turkman. And that’s when the YPG set about punishing the villagers for the militia’s own lack of preparedness. Early in March, YPG commanders arrived in the town, ordered villagers into the schoolyard, and accused them of betrayal and siding with ISIS, said Nasim al-Turkmani, a media activist from the village. Some days later, the Asayish military police returned with lists. Claiming that their sons were fighting with ISIS, they ordered 10 families to go on foot to Raqqa, more than 40 miles to the south. (It should be noted that the YPG has a record of failing to defend the towns it controls and then scapegoating others. In late June 2015, ISIS overran Kobani and killed 286 people. The YPG blamed Turkey for allowing the fighters in, but in fact the YPG had redeployed the forces defending the town to Tal Abyad). Nearly 100 men, women, and children set forth into the night. After walking about 15 miles and hitchhiking the rest of the way, they reached the first ISIS checkpoint. Luckily, ISIS accepted their tale, allowed them into the city, and provided shelter in the homes of Kurds it had expelled. Turkmani visited some of the families. “These are all poor Sunni Turkmen farmers,” he told The Nation. “They made their livings off their farms. Now in Raqqa they cannot find food to eat.” Turkmani now lives in southern Turkey. PYD spokesman Sihanouk Dibo had a ready explanation for the Hammam al-Turkman travesty. He said “elements” of the population there had been in contact with ISIS before the attack and had “brought war upon the town.” He claimed they were expelled “upon the will of the people of Hammam al-Turkman.” But he said he had no idea that they’d been ordered to walk to Raqqa. A second spokesman, Abdul Salam Ahmad, had a different version; he claimed the expellees of Hammam al-Turkman had returned to the village. A more typical expulsion in 2016, only marginally less cruel, befell Ibrahim Abo Omar and his family, Syrian Arabs whose farm is in Tal Abyad, directly across the border from Akcakale, its Turkish sister town. The YPG first came to his home in November 2015, brandishing submachine guns, and demanded that he leave. “Where are your sons?” he recalled them demanding. They were all working abroad, he said. “Either you go to your Erdogan and bring your sons or leave,” they told him, referring to Turkish President Recep Tayyip Erdogan. But he ignored the order. “If I ever see you in Tal Abyad again, I will kill you,” he quoted the officer as saying. “Go to Turkey, go to Raqqa, go wherever.” The family was allowed to leave only with the clothes they were wearing. They walked through farm fields for days, until they reached an Arab village and contacted relatives in Turkey. After sleeping at the border for four days, they paid smugglers to lead them into Turkey. They’re now settled in a house that was under construction at the time of the interview. As they were leaving their home in Tal Abyad, Ibrahim saw trucks draw up to haul away their possessions. Later he heard from neighbors that the YPG had seized all six of his houses and outbuildings, hauled off his irrigation pumps and farm equipment, and even ripped small trees out of the ground. Their crime? “I asked the officer,” Ibrahim said. 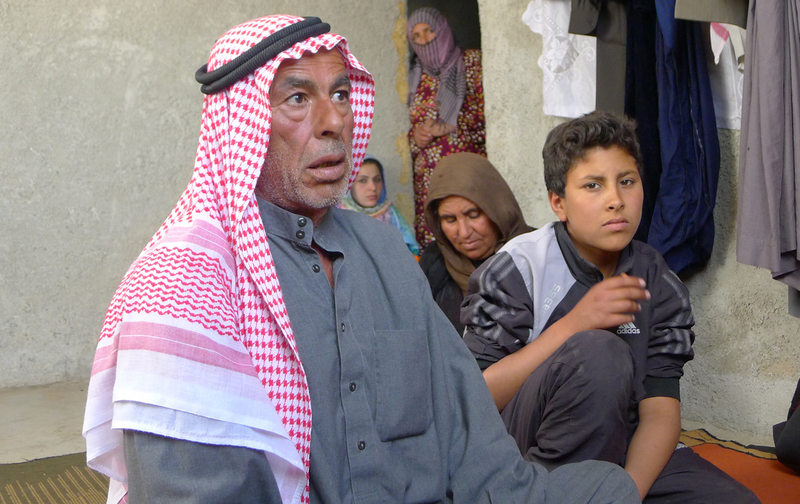 “He said, ‘Shut up.’” Ibrahim, 61, and his wife, Jemila Al Hussein Yusuf, 51, said they were both apolitical and had nothing to do with ISIS when the Islamist extremists occupied Tal Abyad. Both think their crime was that Ibrahim’s nephew is a volunteer with moderate rebel forces. Today, the YPG is still ordering Arab families to leave villages in the border area, according to Ibrahim’s son Assad, 28. Typically, the YPG demands that families hand over one son each for military service in the YPG-led Syrian Democratic Forces, which now serves as the US-allied ground force—or leave the region.